The best holiday dinners are a time of indulgence and contentment; you’ve eaten well and are relaxing with friends and family. And a great meal is one that delivers great flavor (and compliments!) but that doesn’t exhaust you or your patience in the kitchen. I think of tender pork loin as the perfect center course for a small dinner party. It’s moist, not too rich, and always pairs well with side dishes such as the ones we have here. Of course great ingredients matter too, so stopping by Balducci’s in Alexandria, Bethesda or McLean for meat, produce, wine and everything else means a one-stop shop that will really deliver for the home cook. Lay prosciutto slices vertically on 8½- by 11-inch wax paper on a baking sheet, slightly overlapping by an inch. Season the pork loin with fresh ground pepper. Lay pork loin horizontally on sliced prosciutto and roll tightly. Once prosciutto is tightly wrapped around loin, let rest in refrigerator for 1 hour. To cook: Heat large sauté pan over medium heat, add the oil, sear pork loin on all sides until crispy, roughly 2 minutes per side (4 sides) being careful not to burn. Chef’s note: The pan must be hot enough for the pork loin not to stick but not too hot or the prosciutto will burn. Once seared on all sides, remove from pan and transfer to baking sheet and cook at 350° for roughly 12–15 minutes, or until it reaches internal temperature of 120°. Allow the meat to rest for at least 10 minutes, carve and serve. To make the ragu: Heat saucepan over medium-high heat, use leftover oil in same pan as you cooked pork, add the tasso ham and render down until crispy, 3–4 minutes. Add all the root vegetables and cook for another 4–5 minutes, until they begin to caramelize. Add the shallots and garlic and cook for another minute. Deglaze pan with veal demi glaze. Bring to a boil and reduce heat to a simmer. Simmer for 8-10 minutes until sauce reaches desired thickness. Add the white beans and pearl onions, cook for another minute. To finish: Add fresh herbs, remove from heat and add the cold butter; stir constantly until incorporated. Season with salt and pepper. Keep warm until served. This piquant salad is a perfect marriage for this meal and uses apples fresh from the farm market. This is a perfect time to use a mandoline slicer if you have one. Combine all ingredients except the greens; let marinate for 30 minutes before serving. Just before serving, toss apple and fennel salad with the microgreens. 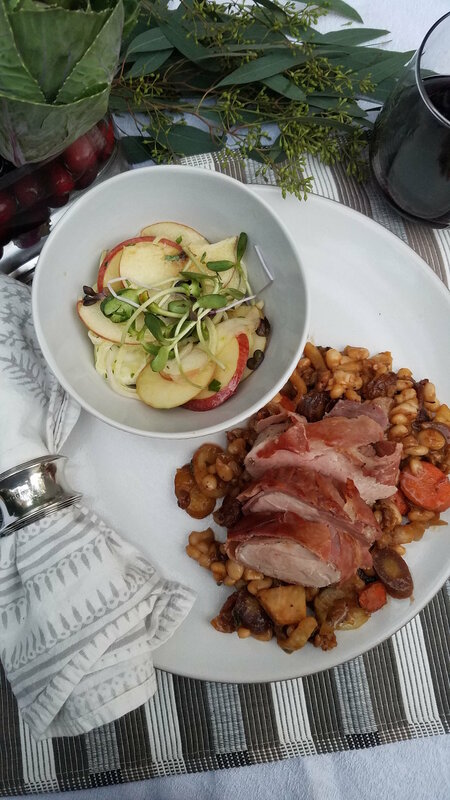 To plate for dinner: Dish some ragu on plate or shallow bowl, slice the pork loin about 1 inch thick, lay slices on top of the ragu and garnish with the apple-fennel salad.